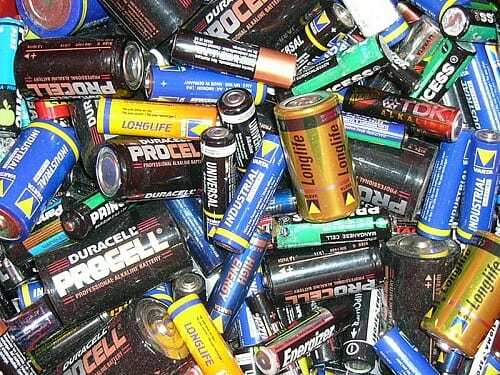 More batteries end up in landfills than are recycled. Today is National Battery Day; the celebration of batteries and how they power our everyday lives. Batteries come in all shapes, sizes and types, with alkaline, zinc-carbon, lead-acid, mercury, lithium and silver oxide being the most common types. However, as wonderful as they are, batteries have a shelf life and, unfortunately, every year far more batteries end up in landfills than are recycled. This is not only bad for the environment because batteries contain heavy metals like mercury, cadmium and lead, but it can also be hazardous to human health, which is why battery recycling is so important. Vermont has made recycling batteries easier for its residents. In the United States, different states, cities and companies have made various efforts to make it easier for people to recycle their used batteries, to prevent them from ending up in the trash. Most notably, the state of Vermont recently created a new law that requires single-use battery manufacturers to take part in a program that manages the responsible disposal of batteries that are sold in the state. Last year, more than 650,000 pounds of batteries were sold in Vermont, but only 36,000 were collected to be recycled. Residents in the state can now recycle all their household batteries (ex. AA, AAA, C, D, etc. ), by dropping them off at more than 100 convenient drop-off sites located throughout the state. These sites include locations frequently visited by the public, such as libraries, municipalities, and retailers, among others. Additionally, to make recycling even easier, residents are no long required to separate single-use batteries from rechargeable batteries. Vermont’s battery recycling first-in-the-nation legislation (Act 139) went into effect January 1st of this year. Aside from municipalities making it easier for residents to recycle batteries by providing them with convenient drop-off locations, there are other ways that people can work on reducing the amount of batteries sent to landfills. For starters, not all batteries are made the same. Some have greener roots than others. Batteries from companies that engage in green practices, and use recycled materials to manufacture their battery products, reduce the need to mine for virgin material to create the battery. This decreases the impact the manufacturing of these products has on the planet. For instance, Energizer’s EcoAdvanced line of AA and AAA batteries, which are their highest-performing alkaline batteries, are made with recycled batteries (4% by total weight), making them a greener choice compared to their other products. Also, portable battery charger manufacturer, Mogix Accessories, uses recycled materials in making their portable chargers. This makes Mogix power banks (designed to power smartphones, tablets and other gadgets), not only reliable and convenient, but also more environmentally friendly compared to other manufactures of external battery chargers that don’t adhere to these same responsible green practices. Know how to recycle a portable charger and other green tips for battery recycling. In addition to purchasing recycled products, other ways that people can cut down on their battery waste is by making the effort to use rechargeable batteries, whenever possible, and even choosing to use certain corded devices over their wireless alternatives (ex: computer keyboard, mouse, headphones, etc.). That being said, all batteries, whether they are reuseable or made from recycled materials, have a shelf life. Therefore, knowing how to recycle a portable battery charger, or any type of battery, and knowing how to effectively get the maximum life out of your batteries, is important. Find out what battery recycling programs are available where you live, and remember to check the type of battery (ex. alkaline, lithium, etc.) you want to get rid of, to find out how to properly recycle it.